Air is one of the most essential elements needed to sustain life. The overall health of your body and mind greatly depends on the quality of air that you breathe. But nowadays people often tend to forget about the importance of clean air. Never take clean air for granted. As an outdoor person like me, when the air gets bad outside, it becomes a natural tendency for us to assume that we will be safer in our homes. Yet, does staying indoors equal to protection from dust and dirt? The answer is NO. Your indoor air is often much more polluted than the air outside. Since we spend most of our time indoors these days, our exposure to poor indoor air quality puts us at risk for a number of ailments, including allergies, asthma, and respiratory issues. We all know that scented candles are one of the easiest and most effective ways to mask unpleasant odors in your home. They’re a go to when creating a relaxing ambiance to unwind after a long work day or while taking a warm bubble bath. I love lighting up scented candles in my room especially during my work! It gives me so much more inspiration especially during blogging! hehe! BUT, one of the main problems with scented candles are the scent itself may destroy our home air quality and cause damage to the brain, lung and central nervous system. That’s the reason why, having an air purifier is really important to keep our indoor air quality better. Recently, I’ve come across the Dyson Pure Cool that helps capture up to 99.95% of ultrafine particles as small as 0.1 microns – which includes harmful components found in the air during the haze periods. Particles as small as 0.1 microns are 1000 times smaller than a human hair and can penetrate the bloodstream when inhaled! Dyson engineers are experts in air purification by combining a 360° glass HEPA filter and active carbon for maximum purifying capabilities! The glass HEPA filter traps harmful ultrafine pollutants, while the active carbon filter traps odours and toxic fumes. I have always wanted an air purifier and finally I got one! Welcome home baby! Let’s unbox it! The whole thing is pretty light to carry from room to room. 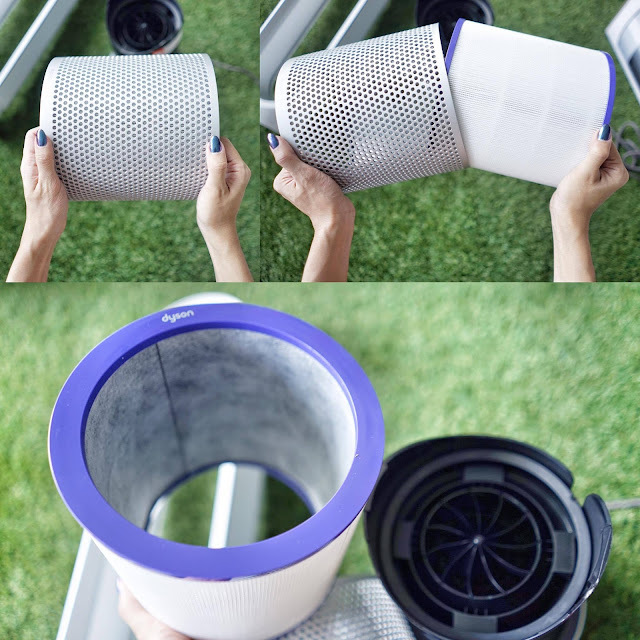 There's two main parts to the machine - the top fan and bottom air purifier. 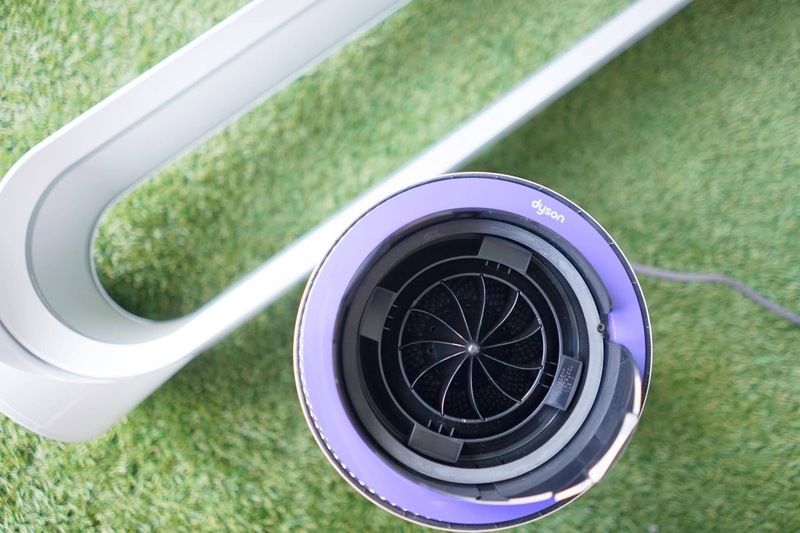 What do I love the most about Dyson Air Purifier? Yay, You don’t have to clean the filter, and you can use it for 12 hours per day for up to one year before it needs to be replaced. Other than that, only a quick wipe with a cloth is required to clean the machine. 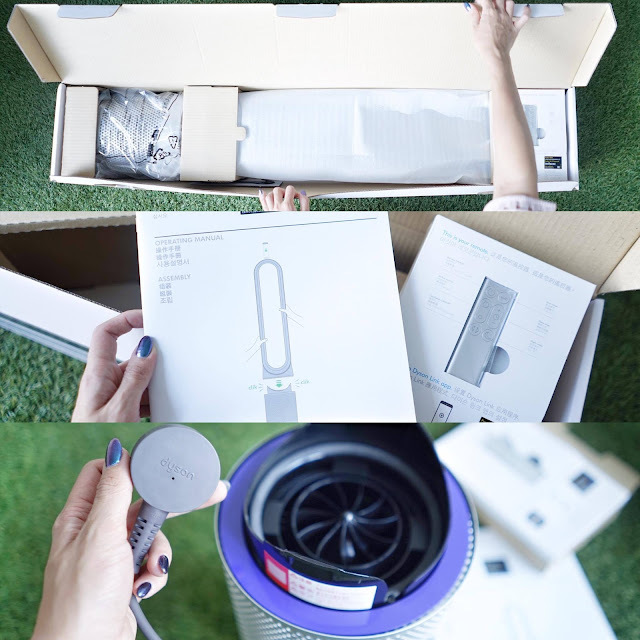 It is really easy to handle, just remove the top fan and change the filter. Even a first time user like me can easily learn how to function the whole thing. 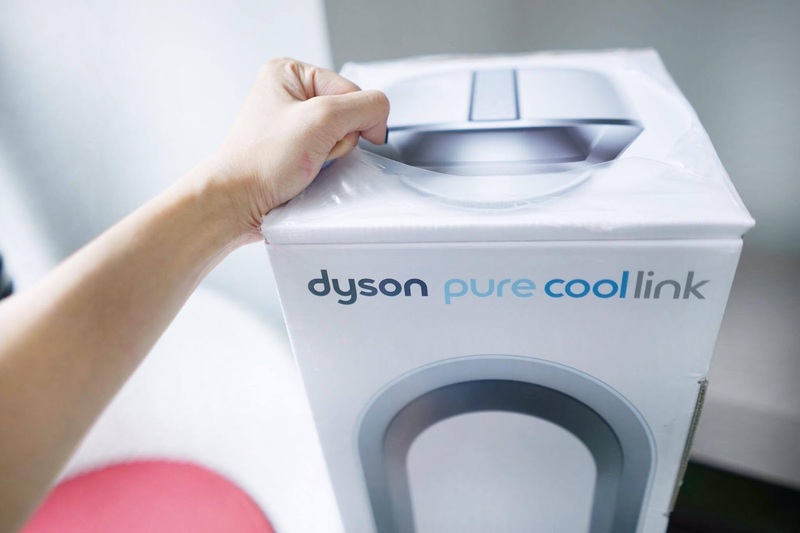 Dyson Pure Cool ™ Link – combines Dyson traditional bladeless fan form with purifying capabilities, which means it takes up less space. On average a 70% smaller footprint than others. 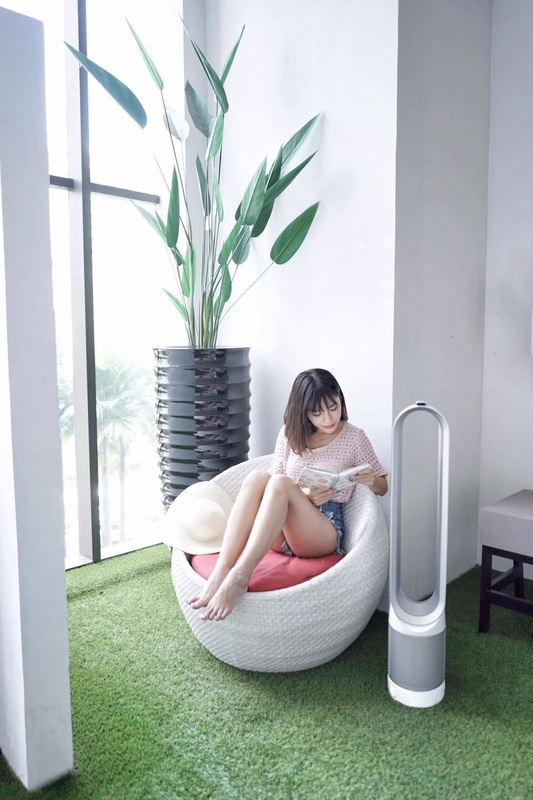 With this, you don’t need to buy a fan anymore because it is a combination of a fan with an air purifier. The remote is magnetic whereby you can just leave it on top of the purifier. Therefore, you don’t have to worry about losing the remote controller with this awesome feature! On top of that! Dyson Air Purifier is also available with a linked App. The Dyson Link app is a handy little app available for Apple and Android. 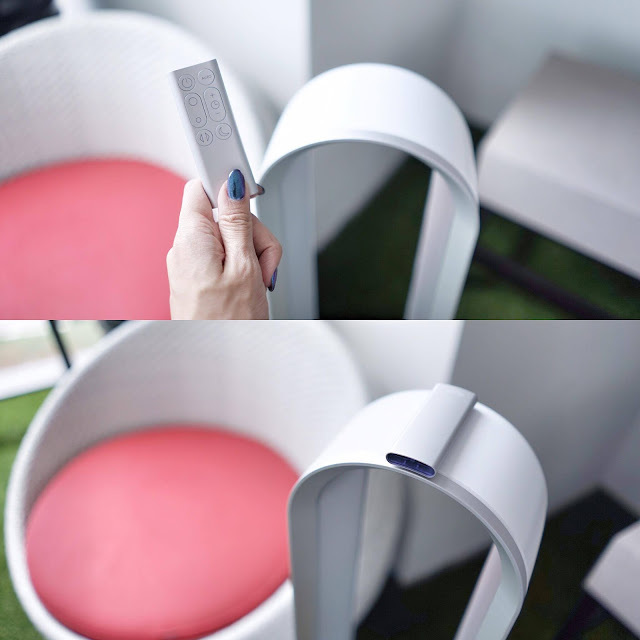 You can just download it on your smartphone and control your Air Purifier remotely. This app will allow the owners to monitor the air quality, temperature and humidity within the home, set air quality limits, see air quality history and start the fan remotely or on a schedule to clean up the air. Did I mention that there’s sensors in the purifier too which can detect changes in air conditions and automatically begin filtering the air when there is a drop in air quality. If you stay in a closed area for a long period of time, you will end up breathing in the same air over and over again. The oxygen content of the air will go down. Breathing this stale air will not supply your body with enough oxygen to keep your cells fueled and functioning properly. If you are breathing in stale air, you may suffer from certain health problems such as dizziness, headaches, fatigue and exhaustion, irritability, colds, or lung diseases. We workout to stay healthy but how healthy are we when the air we breathe is polluted? You know what, it is 10 times more important to have clean air during exercise. We breathe in 2-3 times more air when we workout. Fresh air improves your blood pressure and heart rate. Especially those who have a problem with blood pressure should more aware of this and avoid staying at polluted environments. Dirty environment forces the body to work harder, to get the amount of oxygen it needs. 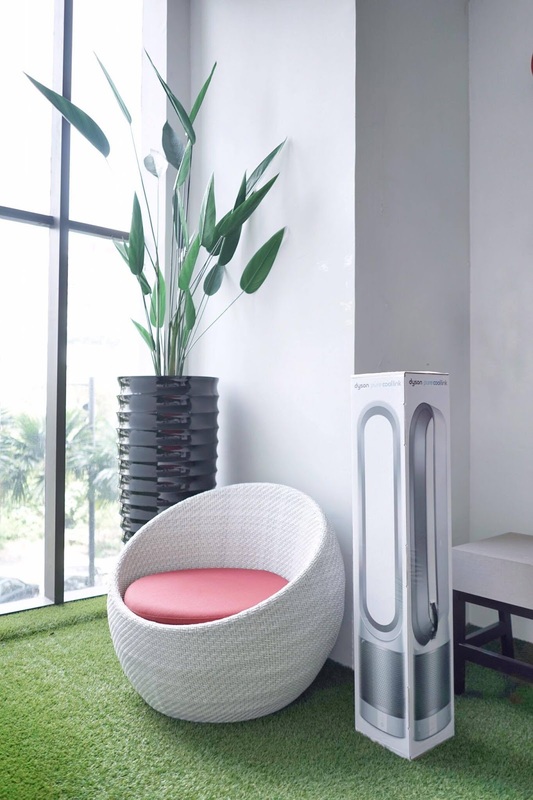 Hence, get a Dyson Air Purifier and stay in surroundings that have a good supply of fresh air. Overall I would recommend that you guys get the Dyson Pure Cool Link as it cleanses the air as we work out, decreases the pollutant level in our homes, doesn’t take up much space at all in the house, has easy remote air quality monitor and easily maintained! Get yours now and enjoy the clean air yourself! Do visit my blog , kebuntepipagar.blogspot.com, lots of entries about how to gain natural beauty and preventing certain disease by consuming herbs and fruits. Tq. 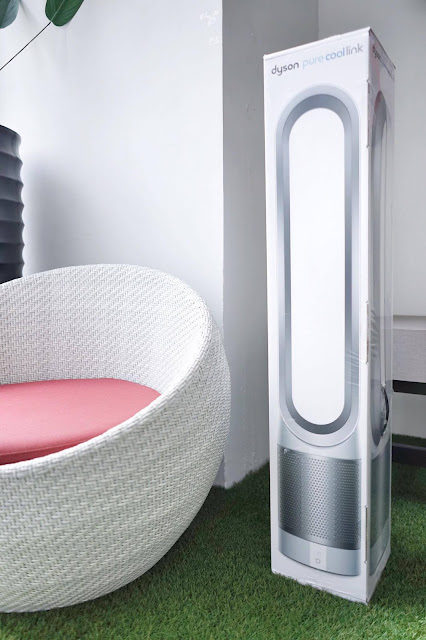 The Dyson Air Purifier is very stylish. have to get one for my home.